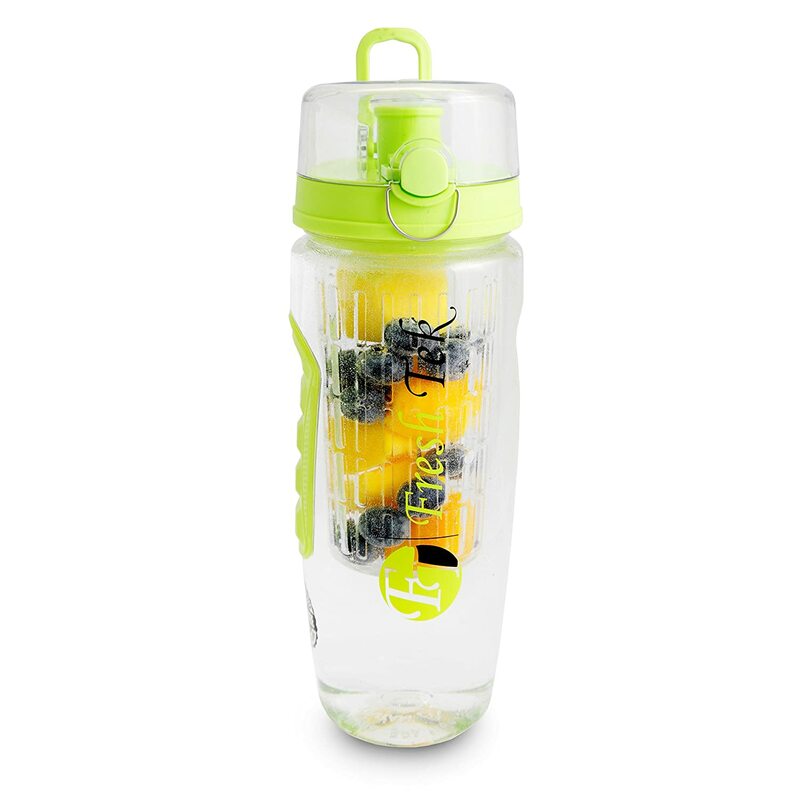 Picking the best fruit infuser water bottle can be challenging even for the most health/fitness-savvy individuals. Did you know there are hundreds of different products to choose from? 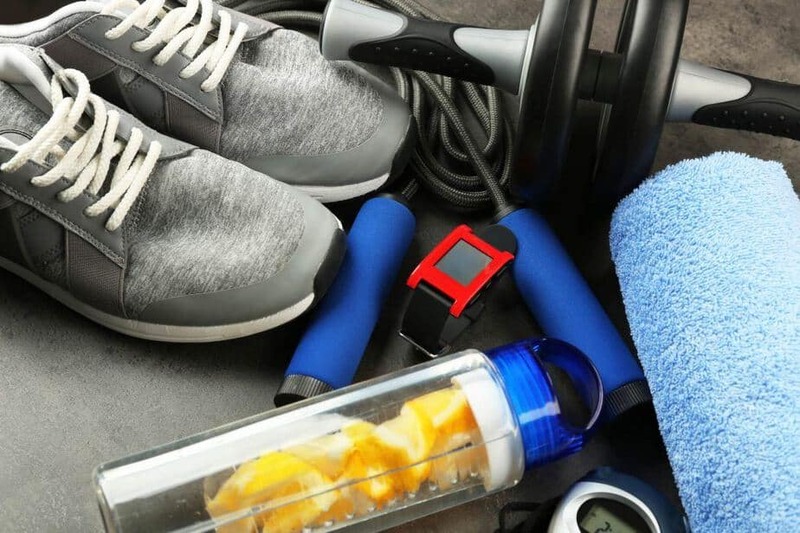 Also, did you know that you can lose as much as 2 liters of water when you work out? How on earth are you going to get in all that water in just one day? Here comes the infuser water bottle to the rescue. 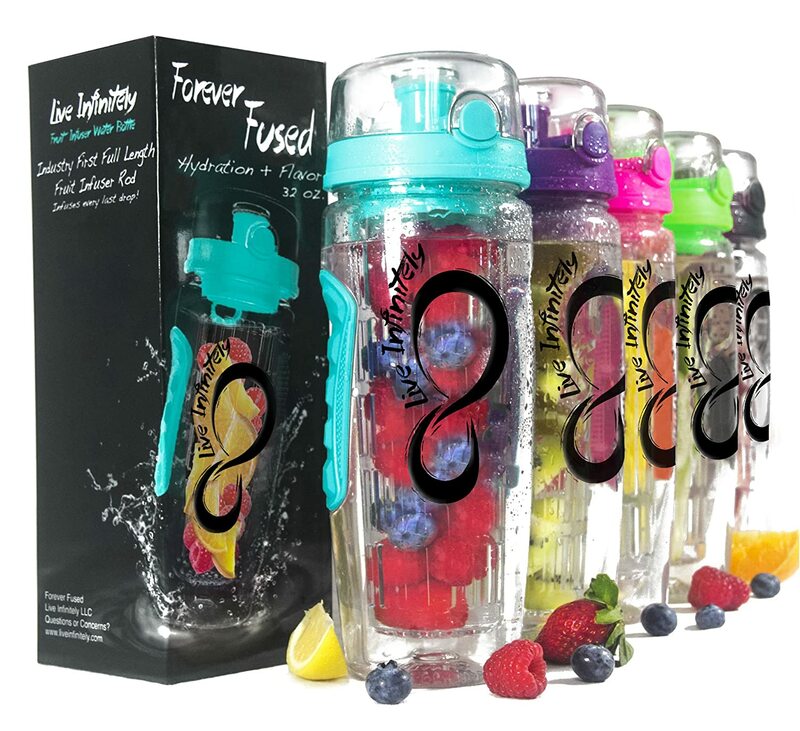 In today’s article we are going to look in-depth at the top infuser water bottles, and guide you to making the right decision. You will learn everything there is to know about different sizing, types of caps, which closure is better or, most importantly, different type of fruit infuser containers. So, get comfortable and let’s get started. What Is a Fruit Infuser Water Bottle? 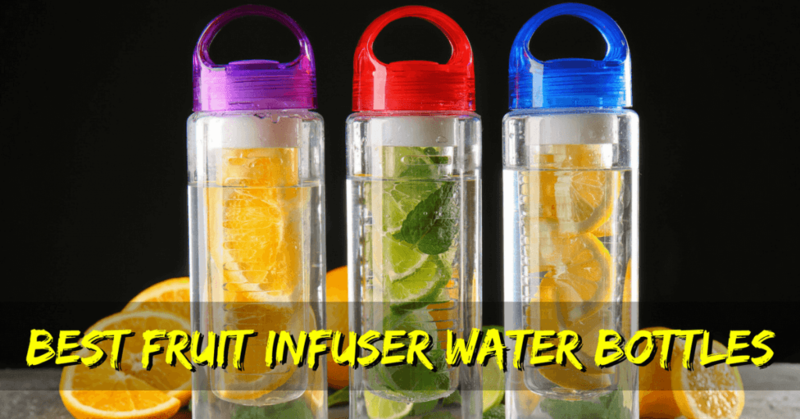 Why You Should Buy a Fruit Infuser Water Bottle? 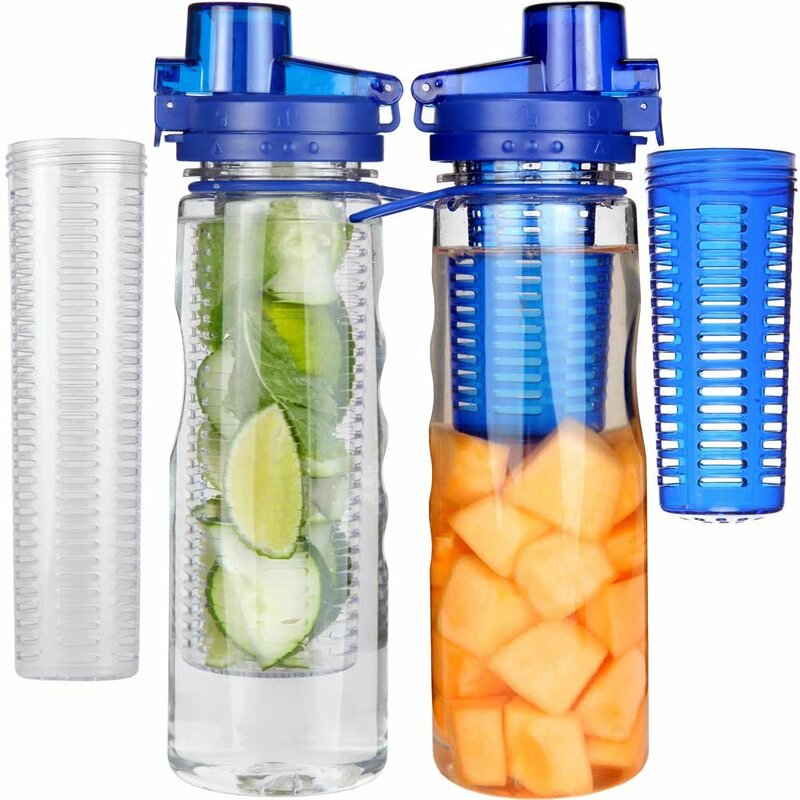 What to Look for When Buying a Fruit Infuser Water Bottle? 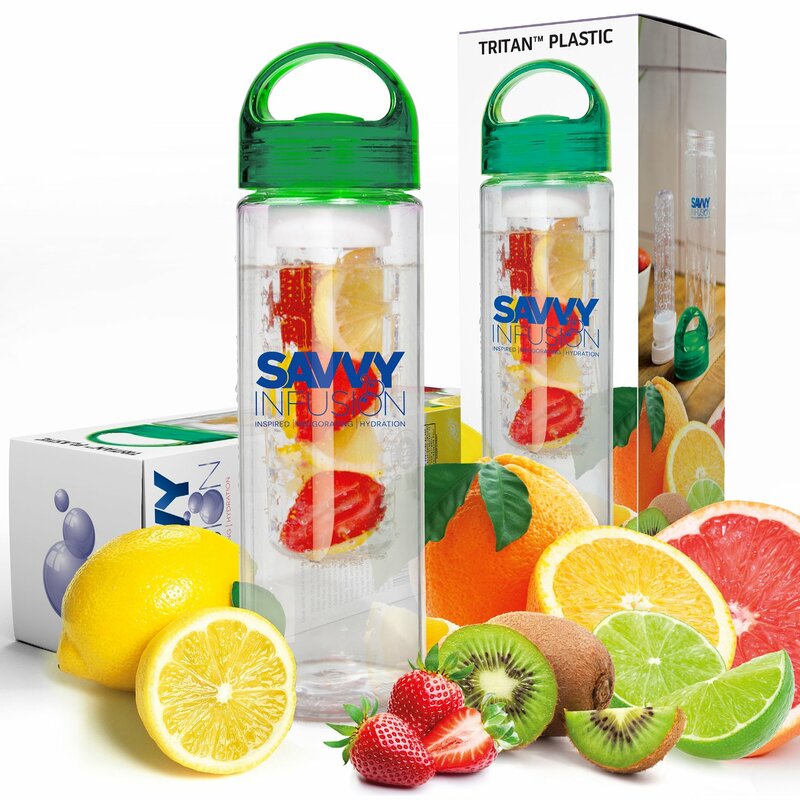 As the name suggests, fruit infuser water bottles are specifically designed for infusing fruit flavor into the water. This is an extremely simple process which uses a separate container that sits inside the bottle. This is called an infuser and it is used to hold the fruits in once place. By firmly shaking the bottle you will get a tasty fruit infused water, rich in vitamin and minerals, but low in sugar. The main purpose of buying such a product is to help you increase the amount of water you are drinking. The Institute of Medicine recommends drinking as much as 1 gallon of water per day. I don’t know about you, but I surely don’t get in that much water. Believe it or not, drinking more water is not just good for health, but it will help you lose weight as well. When dieting, every calorie counts. Why should you get any extra calories from beverages when you can drink tasty water with zero calories? Water is also a known trigger for increasing the metabolic rate, which definitely helps when you’re dieting. Preparing your fruit infused water takes just 2-3 minutes of your day. Just chop the fruits, throw them in the infuser and you are good to go. On top of that, you can use the same fruits for up to 3-4 refills throughout the entire day. 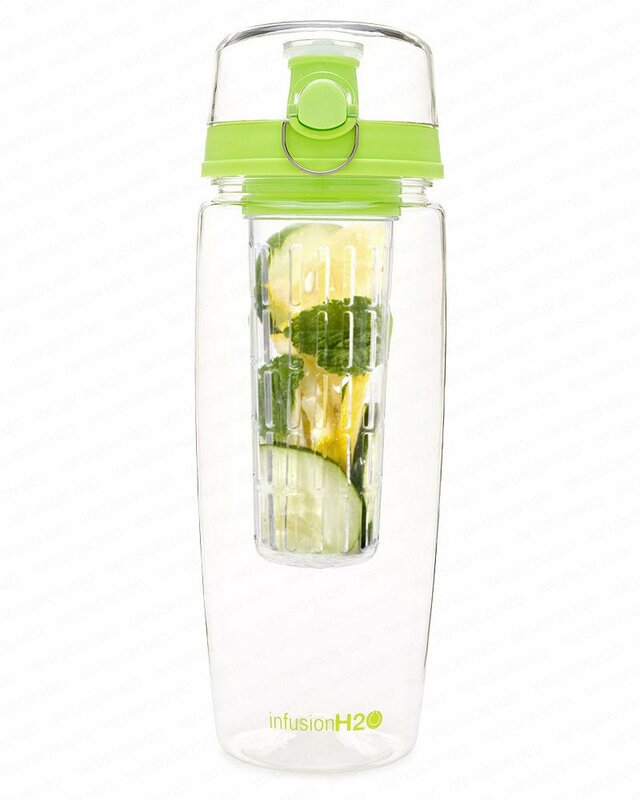 If you compare that with the time any money you would spend on preparing your fruit juice or smoothie, there is a definite benefit of using an infuser bottle. Most infusion water bottles come with free recipe books. You will find tens of different fruit and vegetable combinations to keep you busy on experimenting. You will literally have a new flavor to try out every day. There aren’t that many options here, but you need to pick a size first. Most manufacturers offer just 2 sizes: 32 oz. and 24 oz. Choose wisely depending on how much water you plan on drinking throughout the day and how many times you want to do a refill. Another thing to consider is bottle thickness. If you are in your car a lot you might want to consider a product which will fit in your cup holder. Almost all 24 oz. will fit, but many 32 oz. will not fit. 32 oz. bottles can be quite heavy as well, so if you are hiking or carry an already heavy gym bag, you probably should consider getting a 24 oz. When you buy and plastic container you want it to be 100% Bisphenol A free. This is valid for all drink and food containers. Most water infuser bottles are BPA free, but always make sure to double check. BPA is known to cause health issues such as heart problems, brain, and mental disorders or diabetes. Another important thing to consider is how well built and sturdy the bottle feels. Pay extra attention to the lid. You want it to open and close easily, yet safely with to risk of leakage. The BPA free plastic should be solid enough to take a couple of drops without cracking. The fruit container size can vary a lot. If you want your water to be more flavored you might want to consider buying one with a bigger infuser. If you don’t want a strong flavor you can pick one with a smaller infuser or simply put in fewer fruits. Fruits will take up a lot of the water volume, so take into consideration that you will not be drinking 32 oz. or 24 oz. of water after all. The purpose of the filter is to prevent any fruit pieces or seeds to go from the fruit infuser into the water. Depending on the type of fruits you plan on using you might want to consider an infuser which comes with a filter. Even though, most bottles don’t offer a filter for the infuser, some have the holes small enough to hold inside smaller fruit pieces and bigger seeds (such as seeds from oranges or lemons). Lastly but not least, you can pick between two types of fruit infuser container placements. Most of the bottles come with a top mounted infuser which is not full length. This means that you will have some water left on the bottom of the bottle which will not get that much flavor. A solution to this problem is to go with a bottom mounted infuser bottle which will ensure a constant and rich fruit flavor until the last drop. 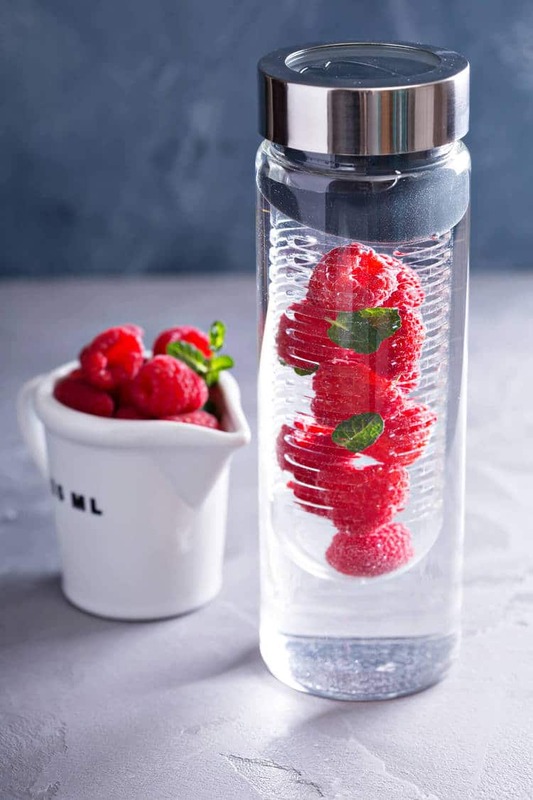 With that being said, lets quickly review the top 10 best fruit infuser water bottles of 2019. Bevgo delivers a super high quality 100% BPA free infuser bottle which will make you fell in love with the product. Depending on how active you are, you will only need to refill just 1 or 2 times a day this large 32 oz. (1 litter) bottle. The great thing about it is the hydration timeline tracker which will indicate how much water you should drink by specific hours on the day. This will be a feature highly appreciated by busy people that forget to drink water throughout the day. The design of this fruit infuser water bottle is very up to date. Even though it’s a large bottle the ergonomics are great. You will be able to firmly hold it with one hand easily. It has a nice handle with a rough patch on one side and a rubber pad on the other side. Other functional features include a carry handle to easily carry it around and a latch for the cap. The bottle itself is build out of a hard but flexible BPA free plastic. Even so, several users have reported broken bottles after dropping them. The Infusion Pro bottle might be a great choice for those who want a smaller, more compact container. This 24 oz bottle is a lot thinner than other products making it a little bit easier to hold it in your hand. On top of that, it will fit in most car cup holders as well. It comes in just two colors – green and black, so you don’t have that many choices here. This bottle has two lids – on the top and bottom, making it easier to clean. The great thing about this bottle is that the fruit infuser container sits on the bottom of the bottle. This way the fruits will be submerged in the water until you drink the very last drop. The fruit container is quite thin though, so you will have to cut larger fruits in relatively small pieces in order to have them fit inside the container. This will result in more flavored taste, so if you like that in your water that’s a plus. The rubbery sleeve will help you better hold the bottle, but will also act as a cushion if you ever drop it. If you buy this product you will get lifetime warranty and a free recipe eBook. This large 32 oz bottle comes with a full-length infuser container for more flavor. The infuser section screws into the top cap and will allow you to fit in a lot of fruits. 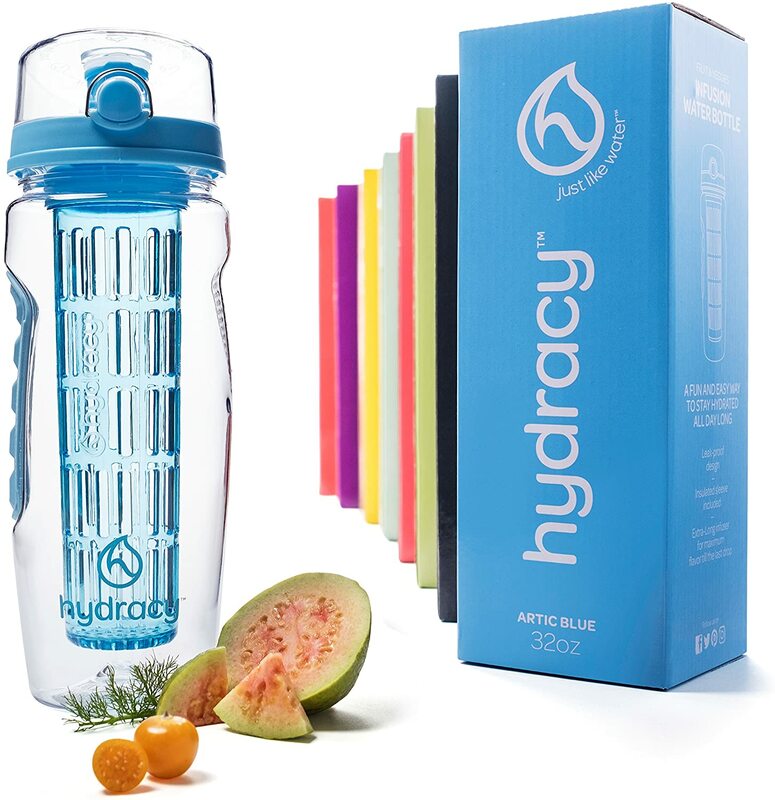 The Hydracy fruit infuser water bottle has an outer sleeve which is supposed to keep your drink cooler longer. Unfortunately, it really doesn’t do such a good job at it, so that might be a little bit of a letdown. The bottle comes with a small carry handle which is attached to the cap. This doesn’t feel to secure though, especially if the bottle is full. It just doesn’t look like it can safely hold a 32 oz. bottle. The lid comes with a metal latch for better closure and for avoiding and spillage. Speaking of the lid, it also comes with a button to push in order to open it, so this is very quick and easy to use when you are in the gym or outdoors. This medium sized water bottle (24 oz.) stands out from the crowd with its hand-twist cap which is also used as a carry holder. The cap comes with a rubber/silicon seal on the inside, which does a great job at preventing any spillage. The infused container is rather short so you will have quite a little bit of water left on the bottom of the bottle which will not get as much fruit flavor as you may want. The holes of the fruit infuser are quite small so you don’t need to worry about any fruit pieces or seeds going into the water. Once you get your hand on it you will notice that the BPA free plastic feels heavy duty. You won’t be afraid of breaking this any time soon. On top of that, it is backed up by a lifetime warranty offered by the manufacturer. What you might not like about the product is that it only comes in just one color – which is red. With a very promising name which reminds of the benefits of drinking water, this large bottle also comes with a full-length infuser container. This will add more flavor to your drink, until the very last drop. The extra-sized fruit infuser will take up for as much as 25% of the volume, so you will not be able to fit more like 24 oz. of water in there. The cap screws into the bottle nicely and quickly, and it also comes with a little metal lock for extra safety. There is also a quick to open push button for the cap and solid handle to carry it around. Even though it’s a large and heavy bottle, the guys over at Live Infinitely did a great job with the ergonomics. Thanks to the rubber pad and the handle with a rough patch which are on each side of the bottle you will be able to get a firm hold of it. 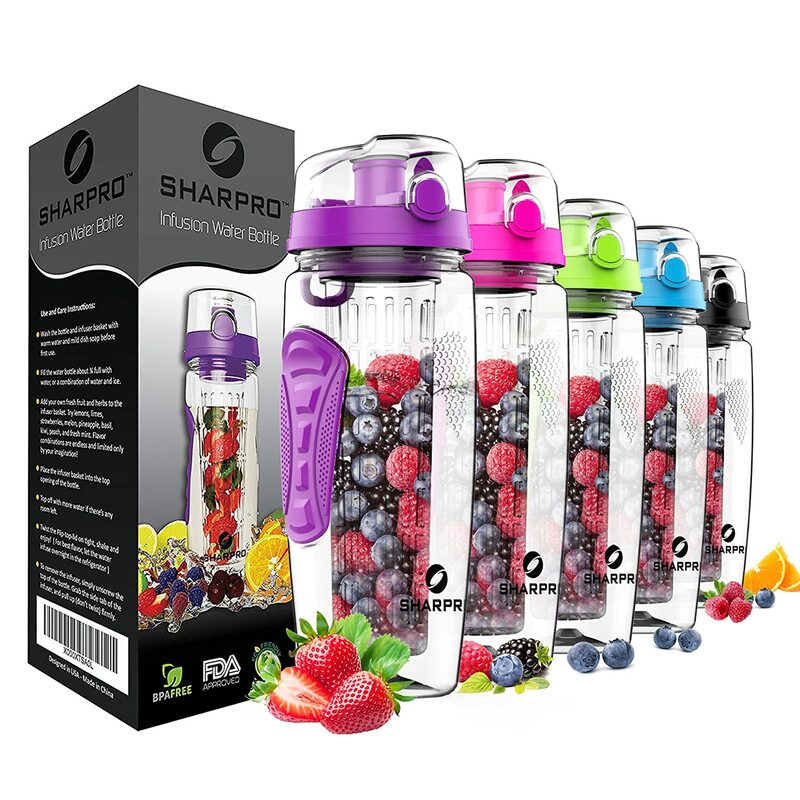 Fully made out of strong and sturdy BPA free materials, the Sharpro fruit infuser water bottle will last you forever. This might be just one of the most durable products you can get your hands on. It features a full-length top infuser which will allow the fruits to flavor the water 100% of the time. The infuser also comes with a seeds filter. So you will not have to worry about any fruit seeds getting into the water. The filter works great for oranges and lemon seeds, but smaller seeds such as of the strawberries might get though. The bottle has grips on both sides and a top handle so it is quite easy to hold and carry around. The lid is a flip top and features a lock to seal it. The 32 oz. Sharpro comes in various colors which will probably suit any user preferences. This is 32 oz. bottle by FreshTek which comes with a cleaning brush. We’ve never seen that in the competitors so it’s definitely and differentiator. Despite its large volume the bottom is smaller and can fit in standard car cup holders. Several users have reported issues with the close and release button on the cap, sot here is one potential downside. Otherwise, the cap itself feels pretty sturdy and there is no leakage. For a 32 oz. large bottle the ergonomics are nicely crafted. The rough patch handle and the rubber pad will enable you to firmly hand hold it with no slipping. Even though the fruit infuser is large enough it is quite short so you will have a lot of water left on the bottom which will not get any flavor. On top of that there is no filter or mesh to keep the seeds from going into the water. 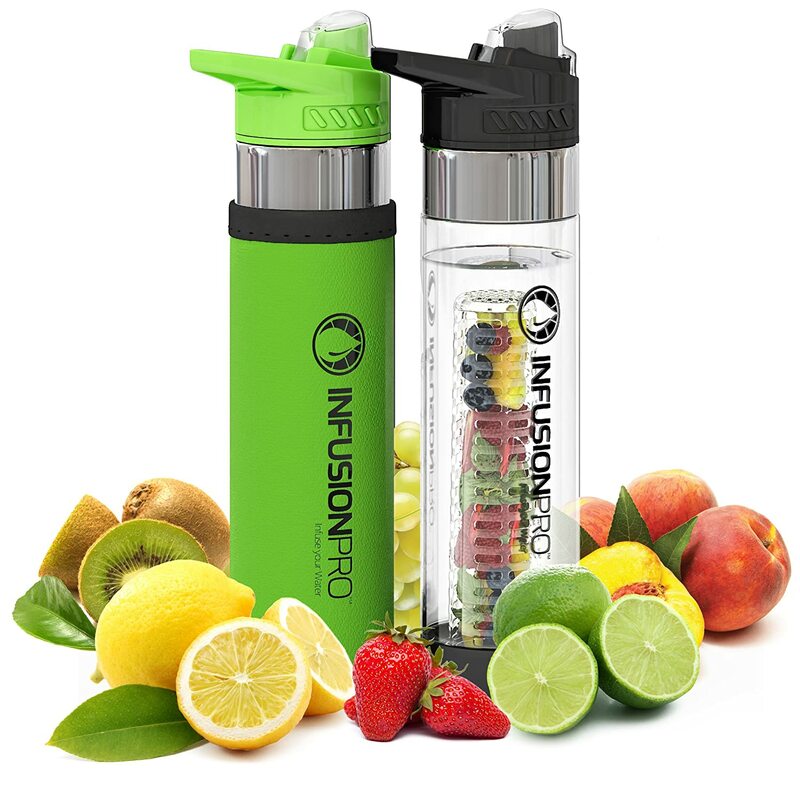 The 25 oz bottle comes in with two different fruit infusers to better suits all user needs. Once you buy this Great Gear product you will get in the package the “Long All-Day Infuser” and the “Small Fruit-in-Bottle Infuser”. The long infuser works like any other regular infuser that you’ve seen on the other products. And it does a good job. The second one, however, it’s a bit different. It will allow you do get more flavor by putting all the fruits outside the diffuser. So, play with it and see which suits your taste better. The bottle also comes with a flip top cap which seals the bottle nicely and prevents any leakage. You get to pick from a wide variety of colors as well. The finger grip fits nicely in the hand, but the plastic feels a little bit slippery, especially when the bottle sweats. We would’ve liked to see some rubber padding. This is a 24 oz bottle which will hold up to 22 oz. when using the infuser. The infuser is pretty small, so this might benefit those of you who don’t really want that much flavor. Surprisingly, even though this fruit infuser water bottle is not double walled, it makes a great job at keeping your drink cold. Might be because of the small size or high-quality Tritan plastic. The lid is a flip-top which you can open easily by firmly pushing your thumb against it. When you close it to make sure it clicks otherwise it’s not actually closed. The lid does not have a lock to secure it, so this is a bit of a letdown. So be careful when carrying it in your gym bag and you might have it sit upside down. Given the size, of course this will fit in any car cup holder. The bottle is absolutely flat, there are no finger grips, no silicone pads or handles. Holding it might be tricky after a sweaty workout. 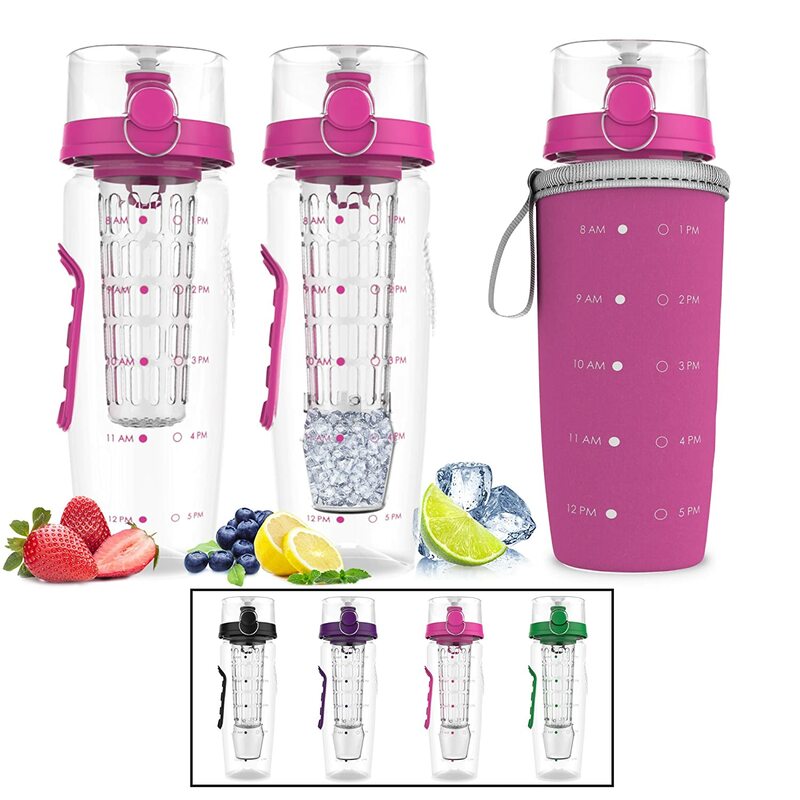 This is a large 32 oz bottle which comes with a small size fruit infuser. The infuser is top mounted which means you will have a lot of water left in the bottle which will not get as much flavor as you would want. The holes of the infuser are quite big, so you will be likely to get some seeds pass through them. The cap is a convenient flip top which is quick and easy to use. It also comes with a silver metal lock to prevent any leakage. On the side of the cap, you will also find nice size and solid carry holder. The material used on the top feels a little bit cheap. It is not up to the same quality used on the actual bottle and infuser. There have been a few reports of cracked or broken caps, so consider this when buying. The bottle has a silicone pad on one side and a rough finger patch on the other side, so great ergonomics. They made the bottom side a little bit smaller, but even so the bottle is unlikely to fit standard car cup holders. 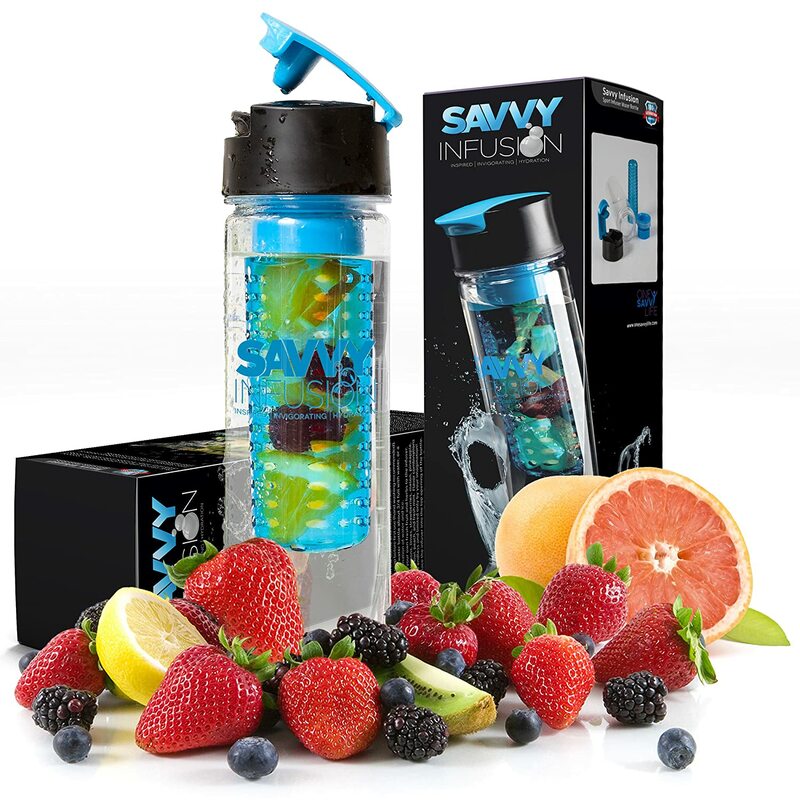 As we just saw, there are a lot of aspects to consider when buying a fruit infuser water bottle. But if you keep an eye out for the obvious product build weakness you will make the right choice. So, which of the 10 products above is the absolute best fruit infuser water bottle? I am sure you know already that there is no right or wrong answer to this question. The best one is the one you want to take with you at the gym, at work, on a hike and literally everywhere. If it helps you drink all the water your body needs throughout the day you’ve found the best one.